This new game from Mindscape adds a new wrinkle to the art of text/graphic adventures. Here at last is a text/graphic adventure that requires no typing! That's right: no typing. All the commands are entered by clicking on-screen commands and items. This system eliminates the time-consuming and frustrating task of trying to find just the right words to accomplish what you have in mind. 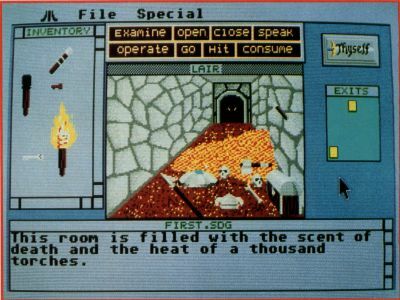 With Shadowgate, you can concentrate on the puzzles, not the semantics. The Shadowgate game screen is divided into four windows. These windows contain your inventory (graphically portrayed), a picture of your location, the existing exits and the game's text. The inventory and text windows, though not GEM windows, contain all the standard parts of a GEM window (scroll bars, arrows, etc), allowing the player to manipulate them as he pleases, even to the point of having them fill the entire screen. This new game from Mindscape has a new wrinkle to the art of text/graphic adventures. Here at last is a text/graphic adventure that requires no typing! That's right: no typing. Because the text window works this way, you can review the game's text just as you would a document in a word processor, by scrolling backwards and forwards through the text. Above the GEM-like windows is a command window that contains eight buttons labeled "Examine," "Open," "Close," "Speak," "Operate," "Go," "Hit" and "Consume." These are all the commands that are necessary to complete the adventure. But don't get the idea that this limited "vocabulary" makes the game easy. The eight commands combined with the large number of onscreen items gives you plenty to think about. Some of the built-in commands have shortcuts. For example, double-clicking on an item (except a door) is the same as clicking on the examine button and then clicking on the item. Double-clicking on a door opens it (if it's not locked), and then double-clicking on the open door causes you to go through it. To "operate" an item, you click on the item you want to use, click on the Operate button, and then click on the item you want to operate on. Combining two items with one command in this way yields a large number of possibilities for the adventurer to try, making this game just as challenging (though less frustrating) as a standard adventure game. Opening items that contain other objects (for example, a leather sack), brings up another GEM-like window that will show what the opened item contains. You may move items between one window and another, placing things in and out of containers. All and all, the player/game interface is nicely thoughtout and executed, making this game a pleasure to play. Shadowgate is a winner. Even people who are not fond of adventure games might find this one a refreshing change. I'm anxious to see more adventure games from Mindscape in this format. That's all the games we've got for you this time around. There are many new games coming out for the ST, and if the games we've just looked at here are any indication, there's going to be a lot of exciting things in the future.